The University of Technology, Sydney (UTS) and UTS Business School are formally recognised nationally and internationally as providing the highest quality university education. After a rigorous review, UTS Business School has been awarded extension of its AACSB accreditation – a status it first achieved in 2007 and which is held by less than 5 per cent of the world's business schools. The AACSB global accreditation standards require excellence in areas such as strategic management and innovation, learning and teaching, academic and professional engagement, and impactful intellectual contributions. Excellence in Research for Australia (ERA) – administered by the Australian Research Council for the Federal Government – rates UTS Business School as “above world standard” and “well above world standard” in research areas such as applied economics, accounting, auditing, business and management. Globally, our ranking in the top 100 for Accounting & Finance and Management & Business Studies, and in the top 150 for Economics & Econometrics in the 2018 QS World University Rankings place us among the world’s leading universities. 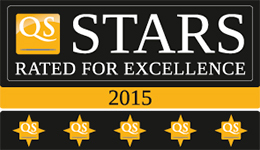 We are the first business school in Australia to be awarded five stars in the QS Stars Business Schools, recognising UTS internationally for its high performance in research, graduate employability, teaching quality and infrastructure. Accreditation confirms our commitment to quality and continuous improvement through rigorous and comprehensive peer review. It demonstrates our commitment to being benchmarked against international standards. Along with our continuing engagement with industry, this external focus helps to ensure our programs remain relevant and up to date and that they match the standards of the top institutions in our fields. Accreditation also provides public reinforcement of the reputation of our degrees, which assists graduates from our programs as they take their practical and creative skills out into the workplace. © Copyright UTS - CRICOS Provider No: 00099F - 16 January 2019 10:37 AM. The page is authorised by Deputy Vice-Chancellor and Vice-President (Corporate Services).